▶ 2-in-1 Touch Screen Stylus + Ballpoint Pen --Works as a normal ball-point pen; High sensitive to type or tap as so to work quickly and accurately. ▶ Half body is filled with sparkling crystals and attractive ten different colors to change for any weathers, cloths, etc ; Great gift for family and friends. ▶ Soft rubber tipped end helps reduce scratches and fingerprints on any touch device; Built-in Clip design for easy carrying or storage - Can be clipped in your pocket, book, diary, etc. ▶ Compatible with any tablets and smartphones with capacitive touch screens such as Apple iPad, iPhone, iPod, Samsung, LG, HTC, Google Nexus, etc. ▶ 18-Month Warranty provided. Any defective product will be full refunded or send new replacements. 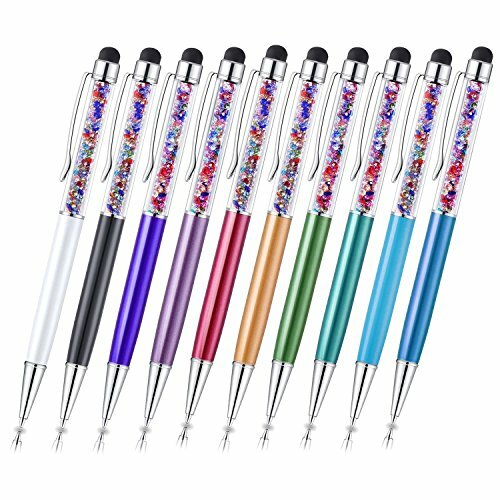 WONDERFUL & CRYSTAL STYLUS RAINBOW - Come with 10 Pack colorful Stylus Pens. Half body is filled with sparkling crystals and attractive ten different colors to change for any weathers, cloths, etc ; Great gift for family and friends. WARRANTY - 18-Month Warranty provided, any defective product will be full refunded or replacement. If for any reasons you are not satisfied with our service or product, please contact us. And we take responsible for any un-expectable issues in 18 months.